It was a battle of titans that have plenty of familiarity with Hays, but this time with different head coaches. Unfortunately, for the St. Mary’s Colgan Panthers, the ending was all too familiar – as a dominant Smith Center running game and tough defense rolled past the Panthers to the tune of 43-7, beating them for the fourth time, and first time since 2008, in a 2-1A title tilt at Fort Hays State’s Lewis Field Saturday evening. The Panthers ended the season at 10-3, while the Redmen finished 12-1, with the losses for both schools all coming against fellow playoff teams in higher classifications. Smith Center’s defense shut down the Panthers running game and didn’t give them enough time to block to get their passing game going, as the Redmen had 29 points before the Panthers got their first, first down with less than a minute left in the first half. The Panthers, who unlike the Redmen had a more balanced offense all season, were held to 85 total yards (5 rushing and 80 passing). Senior Bryce Hutchins was pressured all night, completing 7 of 16 passes for 52 yards, most to fellow senior Jeremiah Buche, who scored the Panthers lone touchdown on the evening. Meanwhile, the Redmen made it clear they intended to do what led them to success all season, and was a staple in their program under Sasse’s legendary predecessor, Roger Barta - run the ball. The Redmen entered the title tilt averaging 335 yards per game on the ground, and finished with 365 on 64 carries against the Panthers. “It’s tremendous; I’m so happy for these kids, what they’ve been able to accomplish at this school,” Sasse said. The Panthers did a decent job against three Redmen in the backfield – senior Cole Hutchinson, junior Hesston Maxwell and senior Trace Haven – but they had no answer for senior Jesse Staples, who ran for 131 yards and 3 touchdowns on 17 carries, to go along with 68 yards on two returns, including a 44-yeard return on the opening kickoff. Staples’ kick return to open the game set up the Redmen on the Colgan 34, and 6 plays later … he punched it in from 11 yards out. The stiff Redmen defense set them up for short fields throughout the first half, as three of their four scoring drives in the first half started inside Colgan territory. Things didn’t change for the Panthers in the second half. On their first possession, Colgan went three-and-out. The Redmen responded with a time-consuming drive – 11 plays, 62 yards taking up 5:33 – again wrapped up with a Staples run - to stretch their lead to 36-0. The Panthers finally got some points on the board with 3:14 left in the third quarter, as they concluded a 5-play, 55-yard drive with back-to-back completions to Buche, a 28-yard flea flicker from Max Wilson, then a 17-yarder from Hutchins, to cut the deficit to 36-7. The Panther defense then stepped it up, as Buche picked off a Hutchinson pass and returned it to the Redmen 48, but Smith Center returned the favor on the very next play, picking off Hutchins at the 19. Even in the rare moment when the Panthers seemed to bottle up Smith Center’s running game – the Redmen would catch the Panthers off guard with an unexpected pass – all of them going to senior Brett Meyer, who had 4 receptions for 56 yards and a TD. The two programs have plenty of history against each other and in state championship games. Colgan has seven state titles, with four straight from 2000-03; the Redmen now have nine titles, succeeding Colgan with 5 straight wins from 2004-08 (including 3 wins over Colgan). But neither team had been back to Hays since the Panthers loss to Meade in 2010. But Seematter and Sasse came into Saturday looking to establish their own legacies, and hopefully start to move out of the shadows of legendary coaches Chuck Smith (343-75) and Barta (323-68), who established the programs as dominant forces in Kansas prep football during their tenures. Seematter is in his first year at Colgan, while Sasse is in his fifth year at Smith Center. 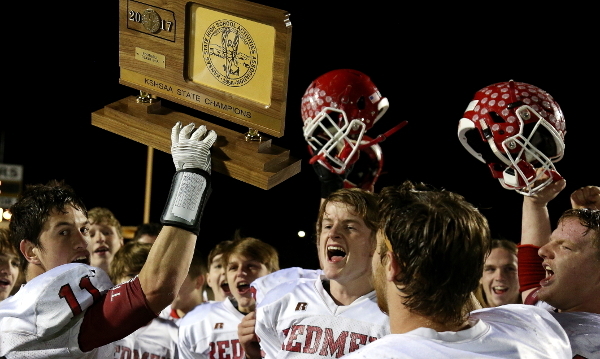 But while one team ended the season with a title and one ended with disappointment, both are already looking forward to next year, as they both drop to 1A under the new classification rules in Kansas. “It will be a lot of the same teams in Class 1A next year,” Sasse said, eluding to the possibility of future state playoff tilts between the two schools.